You are able to complete our Security Operations and Security Risk Management courses online or face-to-face. Our courses allow you to become a security guard by applying to the licencing bodies in each state. The units you need to study to gain a security licence are different in each state and territory so completing the right set of units is critical so you can apply for a security licence in your state. Training is customised to the needs of each organisation and/or individual person who enrols to ensure the best results and outcomes for each client. Discuss with us your situation and your needs; with over 25 years’ experience in vocational training in the workplace, we give clients options and advice on the best course and units to choose, based on your goals. The Certificate I course includes 3 core units from the Certificate II course and elective units for the aviation retail and hospitality industies. This unit needs to be completed if you wish to work as a guard in a venue where alcohol is available. The Certificate II in Security Operations course has most of the basic units required for the issue of Security licence in Australia, but you need to choose the right electives that will give you the licence for each state/territory. If you want to work as a security officer, all of our courses will give you a Certificate II in Security Operations. Each state of Australia has a different number and list of units required to be studied for the issue of security licences. You can complete our security licence course online or face-to-face in a classroom, small group setting, or one-on-one. 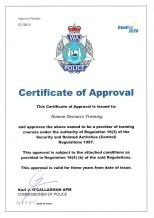 A minimum of 16 units is required for the issue of a security licence in Tasmania. You are able to complete the practical component of the course at our training room - 80 Charles Street, Moonah, Tasmania. In Tasmania you can study seven (7) units and apply for a “Provisional” security licence, gaining the balance of the units over the next 12 months. You can attend a face-to-face training course at our training venue at 80 Charles Street, Moonah, Tasmania. In WA you can complete the security licence course face-to-face in a classroom, small group setting, or a one-on-one session at our training venue located at 2690 Albany Highway (Cnr Turner Place), Kelmscott, Western Australia. Each state of Australia has a different list of units required to be studied for the issue of a security licence. 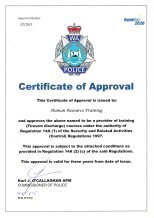 In Victoria we offer the Certificate II in Security operations, but we do not offer a course that leads to gaining a security licence in Victoria. The issue of a security licence in Northern Territory requires the completion of 13 units of study for a general guard licence and 3 additional units for a licence to be able to do Crowd Control work. Each state of Australia has a different list of units required to be studied for the issue of a security licence. 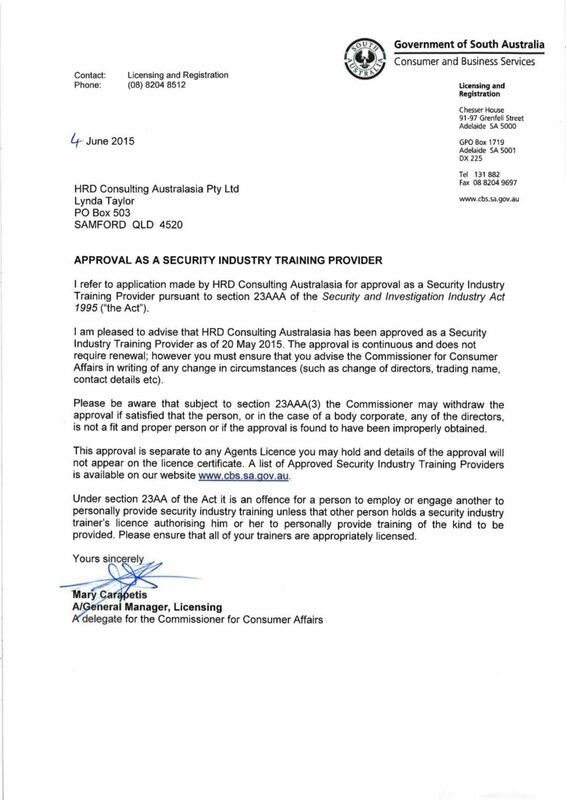 In NSW we offer the Certificate II in Security operations, but we do not offer a course that leads to gaining a security licence in NSW. This course is mainly used by current security officers wanting to study more advanced, specialised skills like crowd control, body-guarding, monitoring room operations etc who are wanting to make security their career. For example: the following two units need to be studied if you wish to be a Crowd Controller. In this unit you will learn defensive tactics skills to control persons using empty hand techniques. In this unit you will learn communication & influencing skills to effectively manage conflict through negotiation. This security certificate course is the pathway for a career in security and risk management, for guards wanting to not only work in security operations, but move into the area of managing risk. This Diploma security course is for experienced security officers who have a breadth of skills and knowledge of coordinating security operations, managing security officers and who have some experience in managing risk. This Dual Diploma gives participants the opportunity to add more business skills to their security background. For more information on studying our diplomas, certificates and security licence courses online, please don’t hesitate to contact us. achieve your Security and Risk Management training needs !